Truck mechanic, husband and father of two, Eddie Hall wants to be the World’s Strongest Man. This feature documentary vividly illustrates the sacrifices that this extremely driven man must make to chase his dream. He will stop at nothing. He trains, eats, sleeps and breathes strongman, competing all over the world and breaking records. He faces not only gargantuan competitors, but his own inner demons as he strives to leave behind the scars of his teenage years. 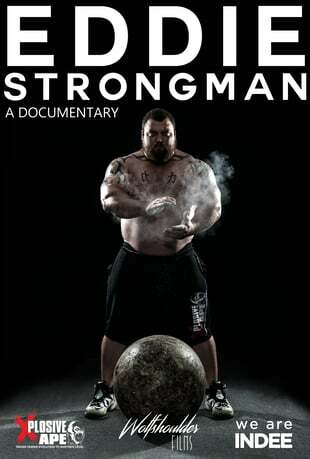 This film gets under the skin of a man totally dedicated to becoming the greatest and offers an engrossing snapshot of an unforgettable character, Eddie - Strongman. Featuring appearances from Arnold Schwarzenegger, Hafthor Bjornsson ("Man Mountain" from Game of Thrones) and multiple World’s Strongest Man winners Bill Kazmaier, Geoff Capes, Brian Shaw and Zydrunas Savickas.